The P1000 water filter cartridge fits all current BRITA 3-Way tap models. The P1000 cartridge reduces limescale, chlorine and impurities for great tasting water. Each P1000 filter cartridge lasts approximately 3 months - that’s 4 a year. The P1000 can be fitted horizontally or vertically and can be exchanged tool free in minutes. Hydration is vital to daily living. Every cell in your body needs water to function properly. It helps replenish skin tissues and moisturises the skin. Water flushes out toxins from your organs and intrinsic to any well-balanced diet. Your brain is approximately 90% water, so drinking water makes you more alert and increases your ability to concentrate. Most health professionals agree that the average human requires 2 litres of water (8 glasses) a day, which is easier when you enjoy the taste. BRITA filtration reduces limescale, chlorine and metals in your water allowing the natural flavours and aromas in tea and coffee to fully develop. Tea gleams clearly and is free from streaks, food flavours can fully unfold and small domestic appliances are protected against limescale build-up. What can I use BRITA filtered water for? Tea, coffee, hot chocolate and hot beverages can be made of up to 98% water. So why not improve your cuppa by using BRITA filtered water and reducing the limescale, chlorine and impurities which leaves the oily appearance on top of your hot drinks and stop the full flavour from fully developing. See and taste the difference with your own tea test. One cup of tea made with unfiltered tap water and then one made with freshly BRITA filtered tap water but be sure to use a kettle which is free of limescale, otherwise your boiled filtered water will end up with bits of scale and will impair the taste and aroma of your tea. Stocks and soups, rice, lentils, pulses, vegetables and fruit all heavily rely on water either as their base or in their preparation. By using BRITA filtered water you're allowing the flavour of your ingredients to really come through and ensure that you get the best results in your cooking. Use it in your cold drinks for refreshing cordials or try something different and use filtered water in iced tea and coffee. You could make fruit filled ice cubes or refreshing ice lollies, delicious sorbets or fruit salad desserts. You can use filtered water in your small domestic appliances. With the reduction of limescale, this could help prolong the lifetime of your kettle, coffee machine, steamer, rice cooker, steam mop or iron. How do the water filters work? Ion exchange resin reduces the heavy metals in your tap water, including lead and copper. It also reduces the carbonate hardness that causes limescale build-up in kettles and affects the taste and aroma of tea and coffee and the flavour of your food. Granulated activated carbon significantly reduces substances that affect the taste and odour of your tap water. They include chlorine, certain pesticides and organic impurities. The P1000 water filter cartridge fits all BRITA 3-Way tap models and fits neatly under the sink. They last approximately 3 months, meaning only 4 cartridges are required a year. 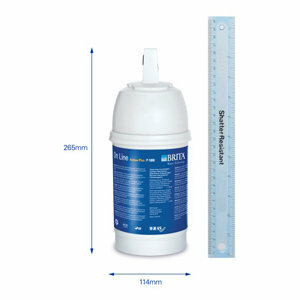 The space saving and compact design of the filter cartridge means its smaller than a 30 cm ruler and fits neatly under the sink and can be fitted horizontally or vertically. 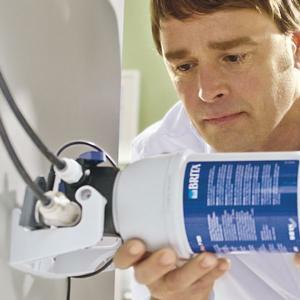 The P1000 water filter cartridge can be exchanged within 3-4 minutes without the need for tools or need to switch off your mains water off during exchange. Each filter cartridge is 100% recyclable.